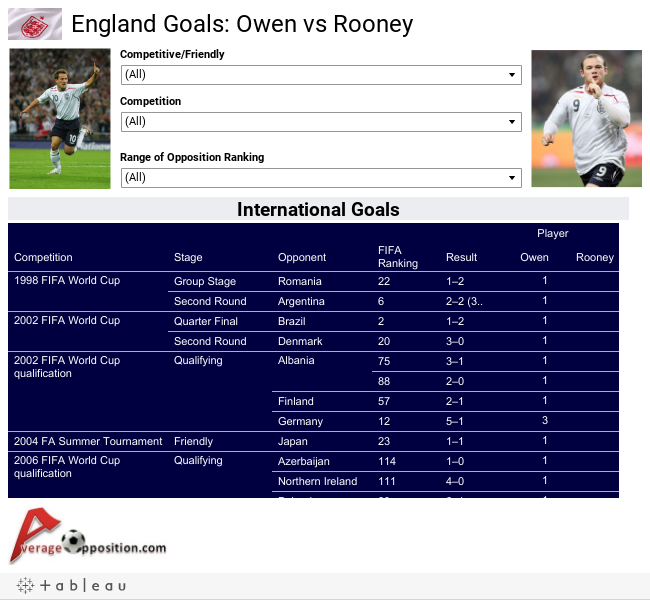 Next up in the Player Comparison series is a quick look at the goalscoring performances for the national team, of the 4th and 5th most prolific England strikers of all time, current England Star Wayne Rooney, and former England striker Michael Owen. 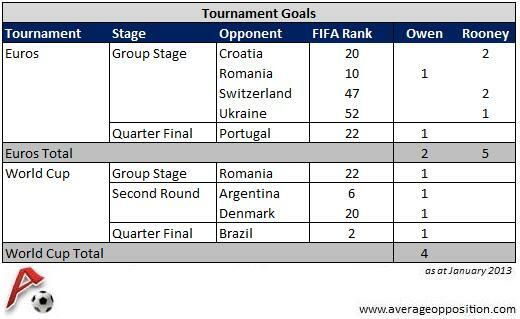 Who has performed better for the National Team, and who's been the better performer in the big games? Read on to find out. In February 1998, Michael Owen made his international debut, becoming the youngest England player of the 20th century, aged just 18 years old and 59 days. Fast forward 5 years to February 2003, and Wayne Rooney was starting out even younger at 17 years and 111 days. Both tasted defeat in the friendlies versus Chile and Australia respectively, but both would go on to enter the Top 5 goal scorers in England History. "At least I'm taller than you﻿"
This comparison is strictly on goals. 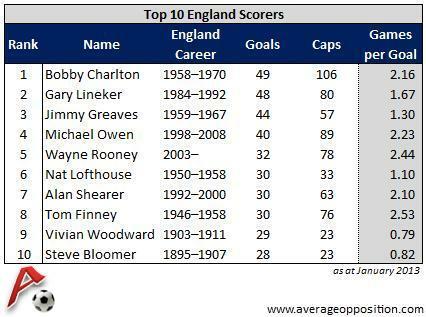 I know that takes away assists which is more likely to affect "Wazza" but seeing as they're both in the Top 5 for England Goals, I thought it worthwhile. The records are accurate as at January 2013. 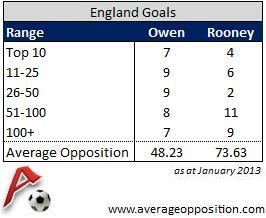 Rooney's likely to score more, Owen less so. 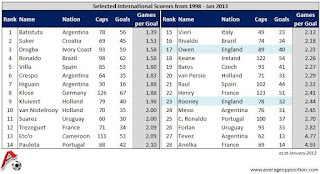 In terms of goal scoring, Owen's decent 40 goals puts him around halfway up the list of illustrious strikers, with Rooney's 32 closer to the lower end. In terms of goals per games though, neither really stand out compared to the biggest names - Batistuta, Suker, Drogba, Ronaldo and Villa. Tevez and Anelka, Premier League peers, even less so. So far, not much in it. So how about the famous Average Opposition and Range Comparison? Once again, a win for Owen. He's scored more goals than Rooney in each of the first three Ranges - with almost double the amount of goals against the Top 10 teams in World football (at the time of the game), and in fact shows great consistency regardless of the opponent. Rooney on the other hand, has the air of a Flat Track Bully, with 20 of his 32 goals being scored against teams ranked over 50th in the World. The average opposition per goal for each player reflects this - with Owen having a decent 48.23 compared to Rooney's 73.63. So does this prove that Owen is the bigger game player than Rooney? It certainly goes some way. Though this doesn't allow for the type of game. When you take into account the Competitive and Friendlies split, it's actually a nod to Rooney. His 32 goals are split as 24 in Competitive games and just 8 in Friendlies (75/25 split) compared to Owen's 26 Competitive and 14 Friendly goals (65/35 split). So from the above, Rooney has the higher percentage of Competitive goals, but in terms of number, they're very similar at 24 and 26. This is the big game player category. Splitting Competitive games into Qualifying and Tournaments, gives an even better indication of Big Game Players. 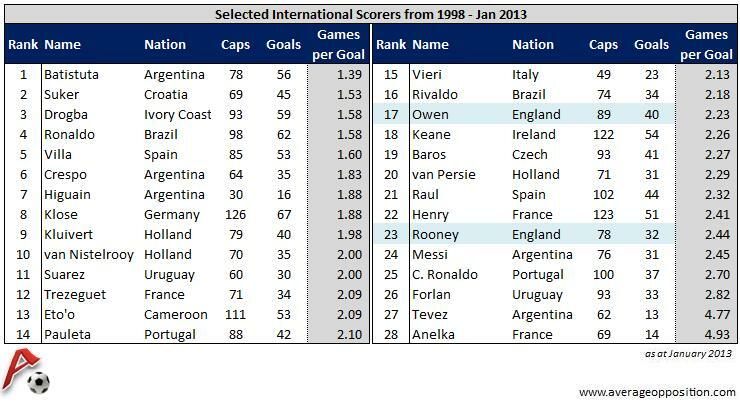 In this instance, Rooney scored 19 qualifying goals to Owen's 20, meaning Owen has 6 tournament goals to Rooney's 5. Once again, pretty close. However, dig a bit deeper and there is only one winner. Whilst Rooney was undoubtedly England's best Player in Euro 2004 when as a teenager he scored 4 goals in the group stages before getting injured early on against Portugal in the second round, his first tournament was the exception rather than the rule. 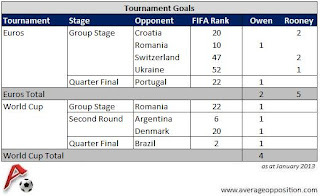 Since then, no goals in World Cup 2006 were followed by no goals in World Cup 2010, and most recently one group goal in Euro 2012 - from two yards out. Against a Ukraine team ranked 52nd in the world. So simply put, if you were a betting man (like the players in question) Owen was the man you'd want for the big occasion - something that he's proven throughout his club career with a double in the FA Cup Final, as well as goals in the League Cup and UEFA Cup finals - not to mention the hat-trick away to Germany in World Cup qualifying back in 2001. That's not to say Rooney is without goals on the big stage as the Champions League Final goal against Barcelona showed. Unfortunately it's not been replicated in the white of England. There's not much in it when looking at the overall records - Owen has a slightly better strike rate but not significantly. In terms of the overall split between friendly and competitive, once again, it's similar, this time in Rooney's favour. The real difference is the Tournament Football. After Rooney scored a brace against Switzerland and Croatia, the team lost it's momentum when he went off injured after just 27 minutes against Portugal in the Quarter Finals. It's hard to predict how the result would have been affected by an in form Rooney playing the whole game. If he'd carried on scoring, who knows what England would have achieved. At the time it was thought that it was going to be the start of a glittering International Career - unfortunately, a mixture of form, temper and injuries has meant the Rooney is still waiting to match that first explosive tournament. At just 27 at the time of writing, Rooney should still go on to reach Owen's 40 goal mark, and perhaps even beating Bobby Charlton's 49 goals for the National Team, but to some it still feels like a career that's failed to reach the massive potential shown nine years ago. Similarly, Owen also excelled in his first International Tournament, scoring the goal of the tournament against bitter rivals Argentina. Unlike Rooney though, he continued to show a level of self control, and form and indeed calmness in front of goal that saw him score in four different tournaments, and most impressively, every knock out game he's played. As a warning to Rooney, Owen also looked odds on to beat Charlton's record but the injury in the 2006 group stages saw the start of the decline in his International career - staggeringly, he was just 25 when he went off against Sweden. Owen had scored his 40th goal by the time he was 26. He's scored none since. So it's also a case of what could have been for Owen to an extent - some poor career choices and unfortunate injuries saw him fall out of favour under both MacClaren and Capello. At 27, Rooney still has the chance to make the grade with potentially three more tournaments by 32. Owen at 33 and without regular club football does not. What happened to the great English Striker?